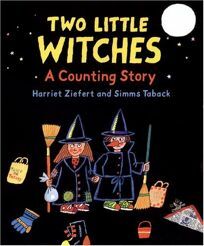 On the flip side, Two Little Witches: A Counting Story (1996) by Harriet Ziefert, illus. by Simms Taback, uses an ever-growing group of trick-or-treaters to teach addition skills. Taback's outlined characters stand out like black-light images against an inky black background.